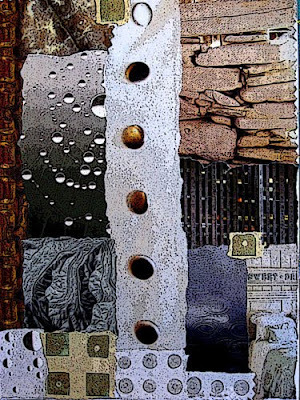 I've begun a new series, of sorts, of smallish, simpler work, each piece of which will be built around digital images. As it happens, I was sorting through my box of images on fabric last week and pulled out this photo of my beloved BeeGee, from early last year, to begin the series. 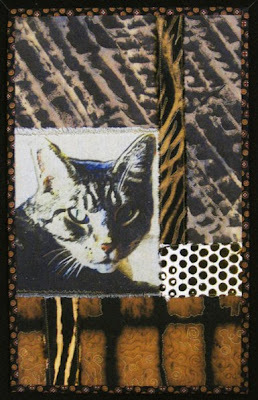 The image is the same one I used on my 2nd weekly quilt from 2009, this one printed on Osnaburg homespun cotton. 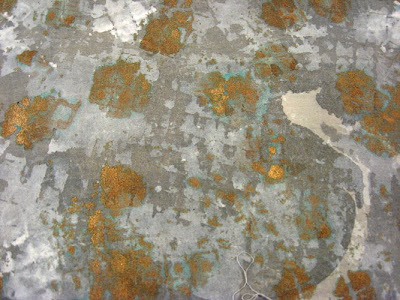 The first image was printed on rust dyed muslin, and you can see it here. I have a second piece in this series ready to quilt this week. Today I'm working on the first articulation of my idea for Fiberactions' Convergence theme. I painted the piece over the weekend with watercolor crayons, and today I'll be thread sketching on it. It's most likely I won't show these pieces until the final quilt is revealed on May 15, so you'll have to be patient. Getting a late start again this morning...I've slept later the last few days, which is a good thing as I'm usually up pretty early. So off to the studio soon. I mentioned recently that my local art quilt group has a challenge going, to create a mosaic quilt with small pieces of fabric. And you know I've been doing dye samples lately...so with all those extra samples of dyed raw silk, I created this mosaic quilt. I'm calling it East/West of Purple. I really love this piece. Color charts and color wheels have always turned me on, so this piece was a gas to make. 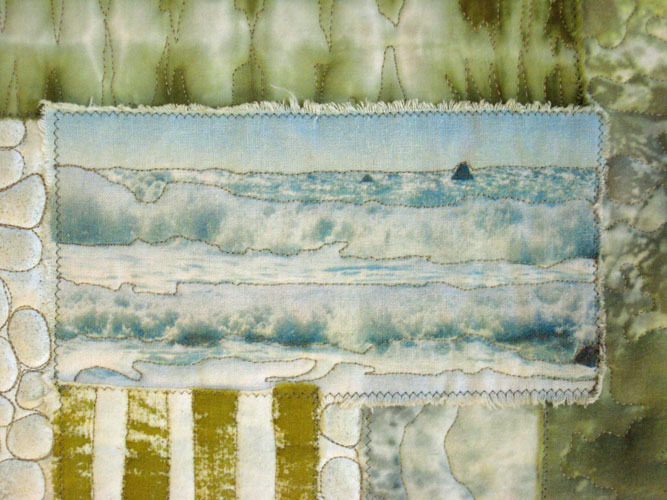 The background fabric is hand dyed muslin. 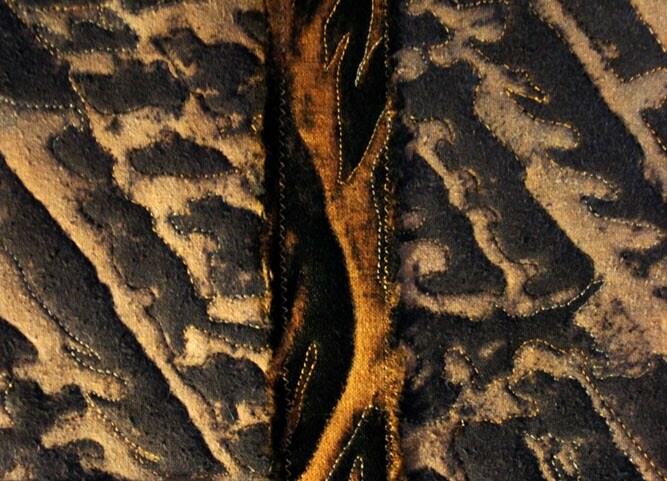 I found a really cool commercial batik fabric to use for the backing and binding, photo just below. This piece certainly wasn't difficult to do, but I did try several versions of stitching the squares to the backing. 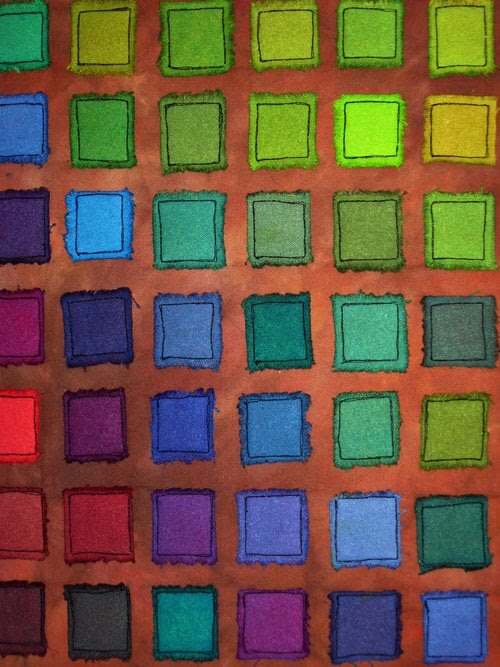 I had an additional 30 swatches so I did a test piece with different thread colors, different square patterns around the samples, etc. In the end, I stabilized the whole top, basted the top/batting/backing together, then quilted each square individually with my embroidery foot. I like the irregularity of the stitched squares, enhancing the irregularity of the sample sizes. Trying techniques and methods on for size is a good thing for me to do. I usually want to just put a piece together and hope for the best. The quilts I've been producing the Fiberactions' challenges have gotten me into this testing mode. Having two months to do each quilt is a good amount of time to try different things to see what works best, and/or to take a piece one step at a time and resolve design dilemmas as they come up. I'm working now on our third piece -- the theme is Convergence -- and I'm making several small pieces with the main idea I want to articulate, trying different color media, different ways of achieving what I see in my mind's eye, to see how close I can come to what I imagine the finished piece will look like. This is good. It really is a challenge! About my process -- I'm really not a sketchbook kind of artist. Or I should say I don't draw everything out on paper beforehand, work out all the details on paper first, etc. I create in my mind. I may jot down a few notes in my daytimer when an idea first comes to me. But then I imagine how it will look, I walk through possible steps, different alternatives in my mind, I visualize how things will fit together or not, until I know what I want to do. And then I'll do it. I think artists' sketchbooks are very cool and I love looking at them. But every time I set about doing one for myself, THAT becomes just another thing to work out visually before committing anything to the paper! Instead of sketchbooks, per se, I keep grid paper spiral notebooks to record process and technique notes, dyeing recipes and procedures, more mechanical and mathematical information, stuff like that. And rough ideas. When I'm ready to proceed on a project, my mind's eye takes over. About finding my voice -- Right now I feel that finding my creative voice is about having the courage to keep moving forward to whatever's next, without stopping at any certain point so that I can say, "Okay, THIS is the kind of work I do." I think I'd rather be known as an artist who tries a lot of different things, than be known for doing one particular kind of work. Yes, recognition is a good thing. But there are a number of well known art quilters who's work, although I like it, has become redundant. They just keep doing the same thing over and over and over again. My modus operandi is, Do it until it's not satisfying anymore, then move on. I don't need to pidgeonhole myself. There are too many cool things to try, and I'm just getting started. It's an evolving process, not a destination. Like life, eh? This piece is my second collage quilt for March, entitled Sparkling Sands. 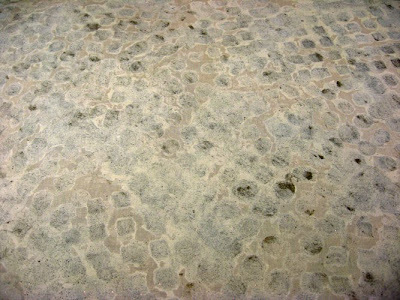 The name comes from those areas of white with circles, fabric that I painted with gesso and glitter a few weeks back. After the piece was finished, I used iridescent blender Paintstix on the circles. The images were sample prints for a project I did last year. They really were too light for my taste but worked perfectly with these softer colored fabrics (which I've used a lot of, this month). In keeping with changing directions, you won't be seeing the original collages any longer. They merely serve as starting points for these quilts. I'm not trying to replicate them in fabric, so it isn't necessary to show how close (or not) I got to the original. I'm not working today so I have a free day, an unplanned for day. I slept late -- it's 9:00 right now -- and soon I'll get to the studio and start working on NEW THINGS! I finished my dyeing sample project on Monday. Usually what I do with those leftover milliliters of dye, after I've removed the sample, is throw it in a quart jar, one for each secondary color. Well since I've got enough of that now, in all three colors -- green, orange and purple -- I decided to soda soak two half yards of muslin and then toss in some of those bits of dyes. These are my finished pieces. I've been thinking much lately about creativity, my process, finding my voice, etc., and I want to share my thoughts with you all. I also have a lot I want to do in the studio this morning, then I have to leave for work at 11:30. So this may get written later. But let me say now, that I've also pretty much decided against entering any more shows and exhibitions with my quilts -- something else I've thought a lot about -- and I realize that this decision has fueled some of my process and voice conversations with myself. 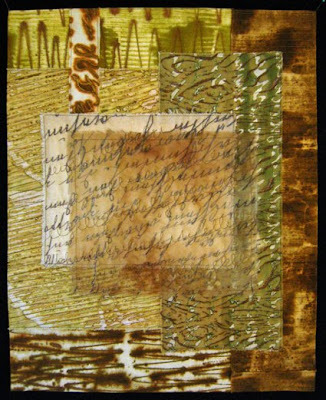 About shows -- not long ago I entered a show of small work, in D.C., and one of my pieces was accepted. The cost to enter the show was $20 (cheap, these days). The selling price of my piece would have been $150. The venue would take 30 percent on the sale, if the piece sold. They insisted that shipments of work be made by UPS or FedEx only (I prefer USPS), both of which are expensive from the North West Coast to the East Coast -- and return shipping would have to be the same method. Plus they were using a shipping agent to handle receipt and return of the artwork. In other words, IF my piece sold, it would have cost me $20 for entry, at least $25 for round trip shipping, $10 for shipping agent services, and $45 for the venue's commission. My $150 piece would cost me $100 to show and sell. If it didn't sell, it would still cost me $55 just to have it seen. Simply not worth it in my book. So I politely declined the invitation. 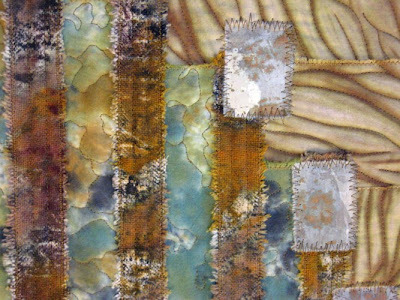 The better quilt shows are fetching up to $70 in entry fees, and hardly anybody gets into those shows except the big name art quilters we all know and love, whose work has graced numerous recent books on art quilting, those who are really pushing the envelope in some way with their work. I don't aspire to that, actually, and I don't think I ever did. There's also the judging issue. 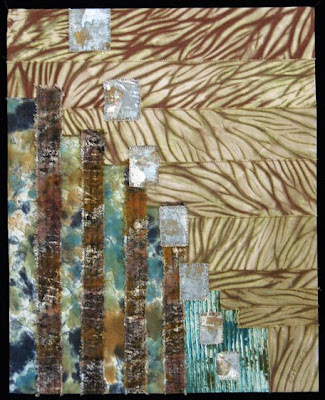 More and more often I hear of fabulous art quilters being rejected from shows because the jurors are less than up to speed on art quilting, or even on what constitutes ART. They judge from some preconceived set of standards that in fact don't apply to the work being judged. I don't even want to play in that pond...let alone spend good money to have my work judged and subsequently rejected by uninformed gatekeepers. So by and large, I'm not doing it any more. I'm making work that I like. Period. 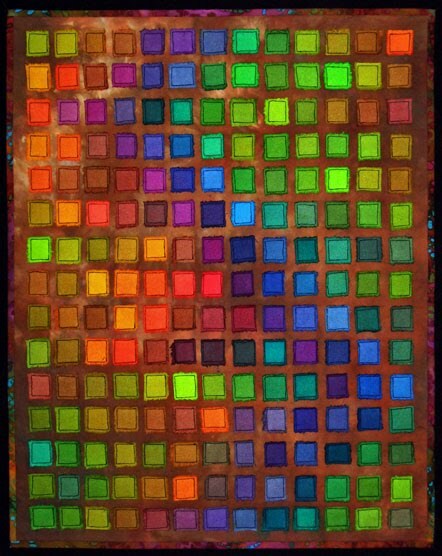 Over the weekend I completed Hope Fulfilled, the quilt I began putting together on a bad hair day several weeks ago. As you can see, nearly all the fabric has been shiboried with dye or discharge. The white areas peeking through everywhere are like vistas of hope, glimmers of light at the end of the tunnel. The finished piece is 29x15 inches. I really enjoyed making this piece. It came together by itself, rather than by my attempt to replicate, in fabric, either a photo or a paper collage. And it made me realize that I'm finished with the photo-to-fabric quilts for now. They're not as spontaneous as I want to be working. 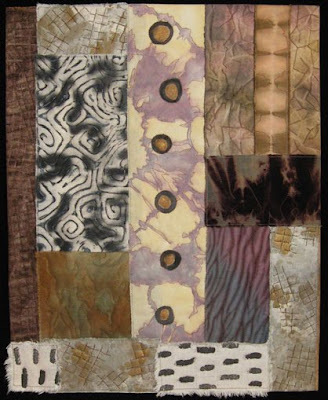 In a sense, either are my collage-inspired quilts -- but the latter are less bound by image. I'm feeling new things, new directions bubble within. Been thinking about this all, in the context of participating in SAQA's Visioning Project, and know this movement is a good thing. I can't hold myself to even my own personal challenges if they no longer satisfy my soul and they've become rote. On Saturday I took an Embellishment/Thread Painting class given by the incomparable April Sproule. I feel so lucky to live in the same burg as April, get to hang out with her in her studio, share ideas and info. Anyhow, now I have new techniques to explore. I hadn't been attracted much to thread painting previously, but now that I've stuck my toe in the water, it's quite fantastic. 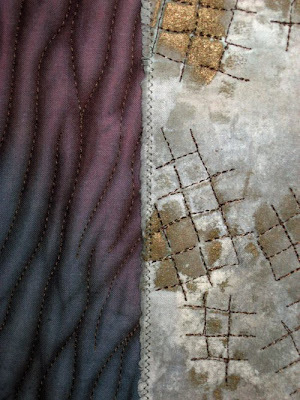 If you're intrigued, also see Susan Brubaker Knapp's thread painting tutorials in this year's Quilting Arts, beginning with the February/March issue. Another March quilt, Circles 3, a 12x12" piece that will be framed today. You may have noticed that thus far with these monthly circles pieces, I've been using fabrics on which I have painted, printed or shiboried circles, previously. I'm having a good time with these. We'll see what turns up throughout the rest of 2010. 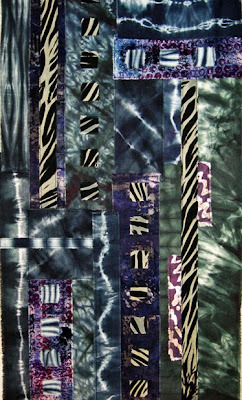 I posted a Shibori Quilt for sale on my sales blog yesterday -- along with five hand dyed fabric collections of three pieces each, fabrics that were previously posted separately, now available in a small group at a discount. Check them out! 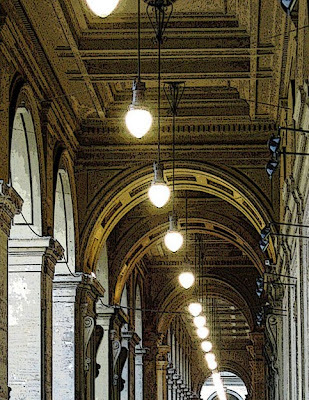 Inspired by the photo below of the ceiling of a walkway/arcade next to a piazza in Florence, here is my first photo quilt for March, entitled Vanishing Point. It's a pretty loose interpretation...I seem to be getting a lot looser with these photo quilts, which is a good thing. Thank you all so much for your wonderful comments and congrats on yesterday's post. I'm still a little bit high, enjoying my 15 minutes of fame for another few moments. I've had a really productive last few days in the studio. My third circles quilt is in process and I hope to finish the last two I have basted by late this coming weekend. 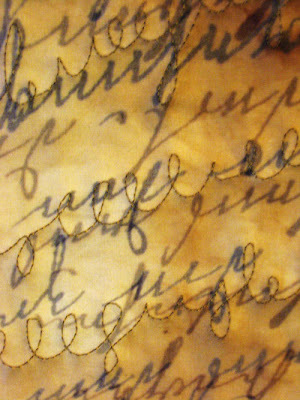 I'm taking a Stitched Embellishment class this weekend, given by April Sproule of Fortuna. Yes, we're virtually in the middle of nowhere here, but we have April, professional longarm quilter and awesome art quilter, who's also a member of my Fortuna Fiber Artists group. The class is happening at Eureka Fabrics, a terrific new fabric shop in Old Town Eureka, owned by another fiber friend, Rima Greer (who's also a wonderful weaver). That's it for now. I've got to get my day started! 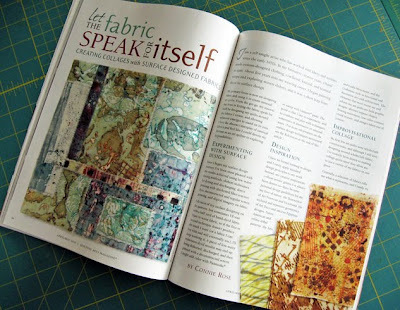 I'm totally stoked to announce that I have an article in the April/May 2010 issue of Quilting Arts, along with photos of three of my little quilts and several surface designed fabrics. 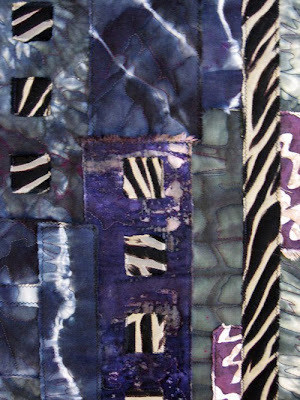 The article, titled Let the Fabric Speak for Itself, is about designing quilts around cool handmade fabrics, rather than using fabric to represent a preconceived idea. This is my first time in print in my modern artistic era...the first time was years ago, I had a piece and instructions in Carol Wilcox Wells' first beadweaving book. 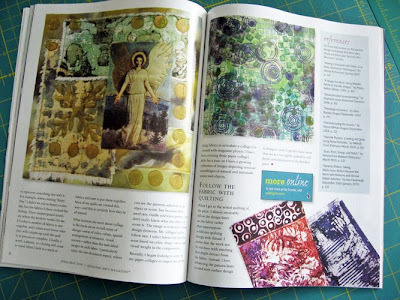 Anyhow, I'm delighted to be among the fabulous artists included in this issue of QA. If you don't subscribe, you'll have to find a copy somewhere! Fiberactions' second reveal day is today, and our theme this time has been Communication. The theme immediately brought to mind the written word, hieroglyphics, coded messages, rune stones and other forms of divination. Spiritually speaking, whatever we need to know about anything is right in front of us or around us. Everything speaks to us metaphorically. 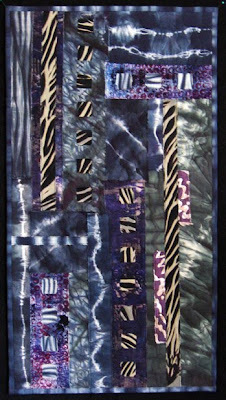 My quilt, Read Between the Lines, represents how our individual world communicates deeply with each of us. All of the fabrics have been handprinted or painted or deconstructed screen printed. I used Paintstix on some of the fabric as well. 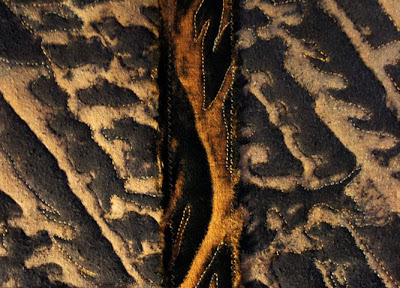 The central images are the same digital print, once on linen and once on tea-stained silk organza. This is the piece that a while ago I referred to as "probably my best quilt to date," and I still think that. I really enjoyed working with these colors and fabrics. Alright, finally a quilted piece to show for this month! There are 4 more right in line to be quilted. This one is called Cloud Hidden, Whereabouts Unknown, which is the title of an Alan Watts book from the 1960's, and which is what came to mind as I fished around for a title for this piece. 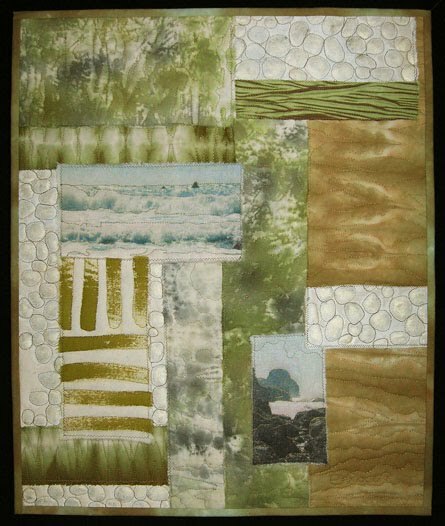 The collage on which this 20x16" quilt is based is just below. This quilt includes fabrics with just about every technique I do -- including shibori, discharge, paintstix rubbings, gesso printed, low water immersion dyed, dynaflow painted, and setacolor sun printed. Whew! I did another batch of fiber reactive color samples today -- actually, I redid the first group (what, again?) with more fuchsia, turquoise and black. I want to arrive at a formula that's consistent for all reds and all blues, instead of having to tweak the recipe for each red and each blue. And what, might you ask, am I doing with all those little sample swatches that I'm NOT going to be using in my color sample book? Well, as luck would have it, my local art quilt/fiber arts group is doing a group challenge, and we're each creating a quilt with our take on the mosaic idea that was featured in QA late last year. 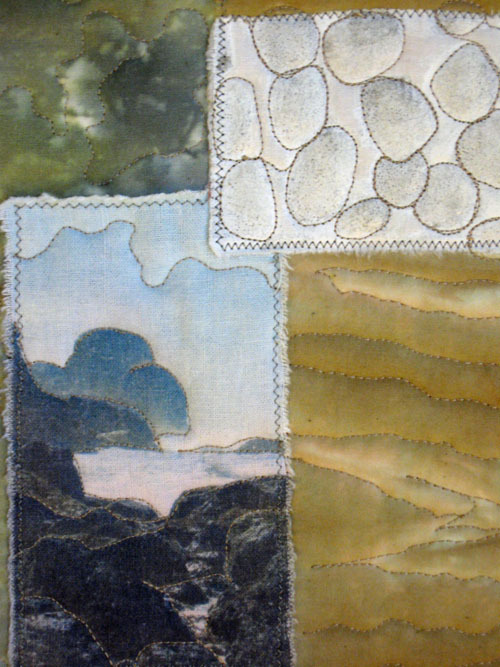 And yep, those cool raw silk samples of mine will become a mosaic quilt! Nothing gets wasted in my studio! Lest you think I've given up quilting, rest assured that I have a growing collection of quilts ready to be quilted for March. 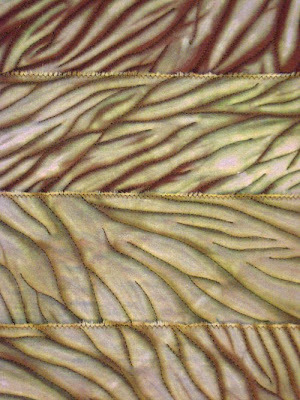 I've been on a dyeing and design roll but very soon will get to the quilting part of art quilting. Meanwhile, here's a cool piece of fabric I dyed a couple weeks ago. This morning I did that second set of color samples, using lemon yellow, fire red and cerulean blue. Can't wait to see them, completely dry, tomorrow morning. Tonight I'm hoping to start in on Season 1 of Quilting Arts TV, which a dear friend loaned me. She's got every season and I'm excited. We do get QA on our local PBS station, but it airs at 12:30 Monday afternoons -- not a great time to watch. So I've never actually seen any of them! I did learn recently that some of my fabrics and small quilts will be shown on a QA segment on deconstructed screen printing that will air in June. My work was back at QA's headquarters being photographed for the April/May issue of the magazine, and they contacted me about holding on to the fabric a while longer to show on the broadcast. How cool is that! And that issue should be out soon. 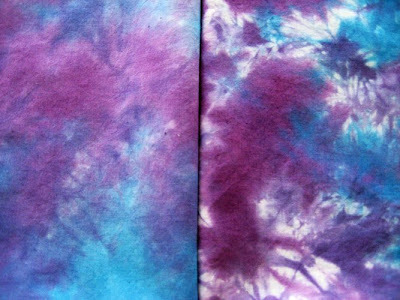 And speaking of cool fabric, if you haven't stopped by my sales blog in a while, I've got some wonderful hand dyed fabrics available. So check it out! 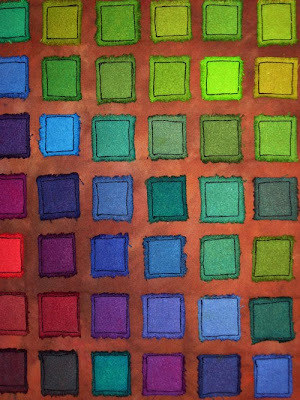 One of my favorite dyeing projects is to create color swatch cards. 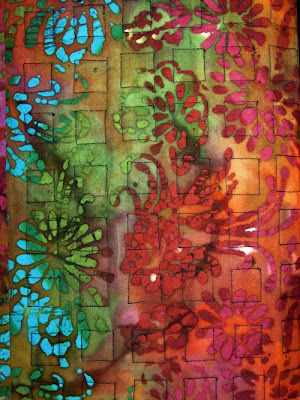 I did this extensively with acid dyes, about 10 years ago, and I have referred to that color book countless times over the years to reproduce colors. So I began this project over the weekend, with fiber reactive dyes. I've been wanting to do this since I started with fiber reactives, two years ago, but now I'm finally comfortable enough with tinkering with the dye concentrations, enough to launch into a new color swatch project. 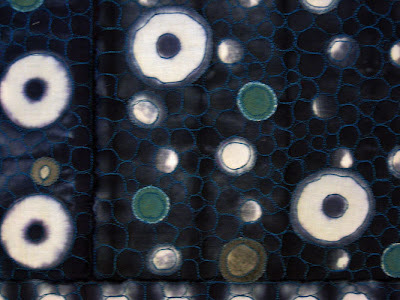 One of the biggest -- maybe THE biggest -- difference between using acid dyes and using fiber reactive dyes is this: acid dyes are of equal strength, whereas fiber reactive dyes require fiddling with the relative concentrations of yellow-red-blue in order to mix correctly. That's why it's taken me so long to get to this point in my self education. For instance, with acid dyes, to mix dyes of equal depth of shade (DOS), you use the same weight of dye powder to an equal amount of water. Such as 1 gram of dye to 100 ml water, which equals a DOS 1, regardless of what color you're mixing. With fiber reactives, reds are 3x stronger than yellows, blues are 2x stronger than yellows. So to mix an equivalent DOS with fiber reactives would require, generally and theoretically, 3 tsp yellow to one cup water, 2 tsp blue to one cup water, and 1 tsp red to one cup of water. So I started the weekend's color swatches with lemon yellow at 3 tsp per cup water, turquoise at 2 tsp per cup water, and fuchsia at 1 tsp per cup water. I made the orange page of swatches -- like what you see at the left above -- and discovered that there was still way too much fuchsia in the mix. I did the same thing with the greens and discovered that there was also way too much turquoise in the mix for my taste. So I kept halving the fuchsia and turquoise until I got a percentage that worked for me, that subsequently mixed colors that I would use. The photo above is what I arrived at after numerous experiments with color concentration. All the colors are then based on 8 or 9 ml of dyestock, in the concentrations listed. The lightest orange is 7 ml lemon/1 ml fuchsia, the darkest orange is 1 ml lemon/7 ml fuchsia. The middle swatch in each row has 1 ml black added; the right swatch has 1 ml turquoise (the right column always has the complementary color, which will change on each page). After I make the swatches, I toss the leftover dye into one of three quart jars -- orange, green, purple -- and use that for other dyeing projects. My next set will be with lemon yellow again, fire red, and cerulean blue. Actually, I did an entire set with those colors today, using the same formulas as above. But the colors in this case were not intense enough so I'm going to do them again, and I'm going to double the blue and red this time. 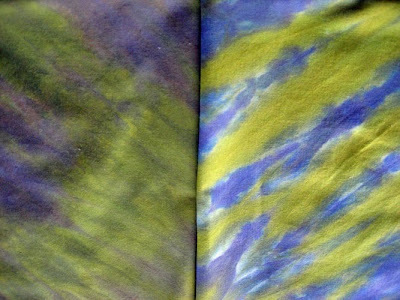 I continue to do dyeing experiments, changing one variable at a time to see the different effects. I did these two this past week. All samples are fat quarters of muslin. For the set on top, I used Procion chartreuse and lilac. Both pieces were loose folded on the diagonal, and the fabric was dry to start. The sample on the left had dyed applied to it first, was left to set for 45 minutes to an hour, had soda/salt solution poured over, and then batched for 24 hours. The sample on the right had the soda/salt solution applied first, was left to set for 45 minutes to an hour, the extra solution was poured out of this tub and into the first tub, then the dyes were poured over and left to batch for 24 hours. For the second set I used Procion electric blue and Sabracron purple. The two batches were processed exactly as they were in the first set -- EXCEPT that the fabric had been presoaked in warm water for 30 minutes, then wrung out. Then I proceeded as above, the left sample getting dye first and the right one getting soda/salt solution first. As I've found in earlier dyeing experiments, there's really no resulting difference in starting with dry fabric or with presoaked fabric. The primary difference is in when the fixing is done, either before adding dye or after the fabric has sat with dye on it for a while. 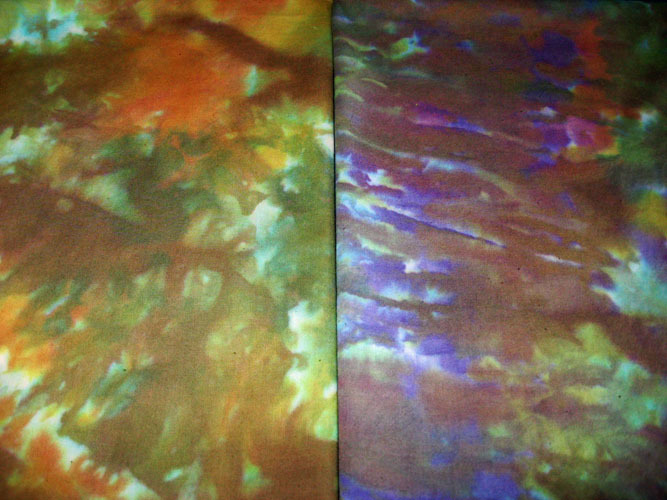 The dyes comingle more when added to the fabric straightaway. A note on wetting fabric beforehand: some folks recommend it and some folks don't. Why am I not surprised! In theory, if you wet fabric first, then the dye sites are taken up with water and therefore unavailable to accept dye molecules, meaning there will be more white or undyed areas on the fabric. But also in theory, if you wet out fabric, then the colors wick more readily, meaning you get potentially better coverage with the dyes. As with everything else, it boils down to personal experience. I actually like the effects I get better with prewetted fabric, although I only do this with low water immersion and direct application. 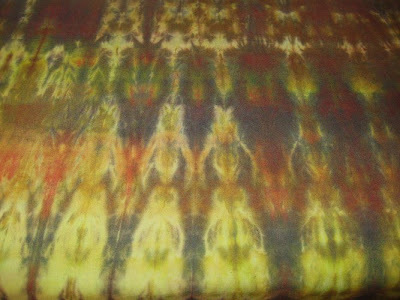 If I do a regular immersion-style shibori dyebath, then I'll start with dry fabric -- primarily because it is much easier to manipulate dry fabric than wet fabric. The volume of water in the dyebath, though, pretty much guarantees that the fabric will get wet through and through. There are so many variables to consider with dyeing, which I think is why I'm so intrigued with it. There are so many options to play with, so many possibilities to try out. And everybody seems to have different experiences because of a multitude of environmental variables. Thus I've concluded, in the end, to each her or his own. 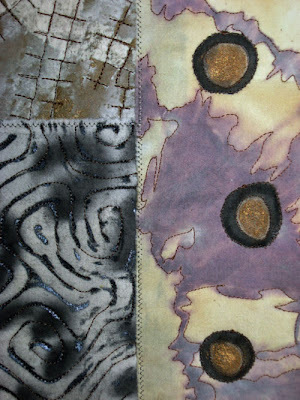 I've been intrigued lately with using white paint and metallics on white or previously dyed fabrics. These are my initial experiments. 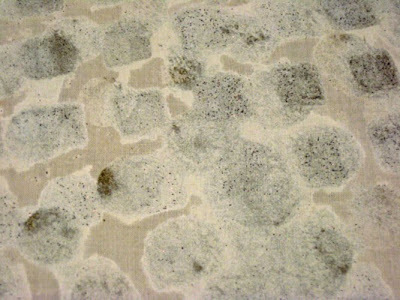 The first and third photos are of muslin that I "marbled" a while back, using the suminagashi technique (printing oily ink that's floating on water). The second and fourth photo are prints on white muslin. 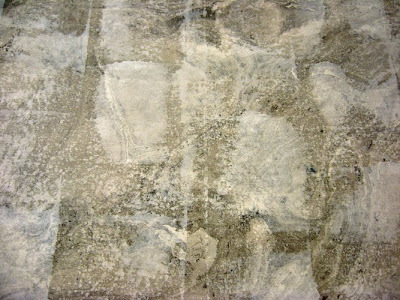 For these pieces I used white gesso, which is an acrylic, although commonly used to underpaint canvas. But I think I'll try white acrylic paint next time to see if the results are any different. The sun's out this morning and I'm on my way to the studio shortly. Hope you have a wonderful day! This is a new piece I'm working on, that I began putting together the other day -- a day that started out feeling kind of hopeless for me -- hence the title will be something about hope. I almost decided to abandon my monthly photo-to-fabric quilt challenge beginning this month -- until I blocked out the first piece yesterday. I do think, though, that I'll be using two photos each month from now on, rather than doing two interpretations of one photo...and giving each one my very best shot. I'll be doing some new work with thickened dyes today. Most of what I did in the past was fairly ad hoc -- i.e., I made it up as I went along, trying a little of this person's recipe or procedure, a little of that person's, and some of my own. Kinda the way I embarked, originally, on dyeing with fiber reactives. Although I liked what I produced, the process was rather disorganized. The grand spiral has brought me back to the beginning again, albeit from a higher place of awareness about the process. 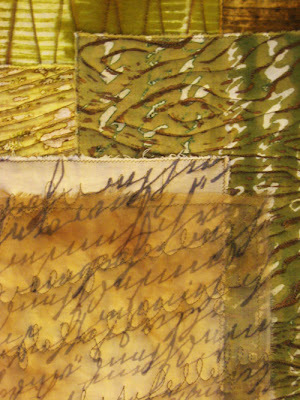 I'm working with Ann Johnston's Color by Design, which I highly recommend. I also love Ann's Quilter's Book of Design, 2nd Edition. Her books are relatively pricey -- even at Amazon -- so it took me a while to get them. But most definitely worth the price for all the info and the wonderful photos contained in each. Enough with the promo -- I'll shoot photos today as I go along and post some tonight or tomorrow.